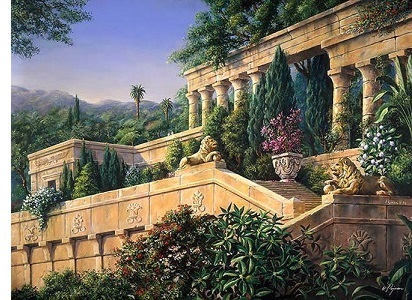 Hanging Gardens - One of the Seven Ancient Wonders of the World and the one of which probably the least is known. Other than being mentioned in a few ancient writings, no other evidence of their existence has ever been found. They were said to have been built in Babylon by King Nebuchadnezzar for his wife, Amyitis, who was homesick for her native land in the Zagros Mountains. However, excavations in Nineveh have uncovered aqueducts which indicate that the Hanging Gardens may actually have existed in the Assyrian capital rather than Babylon.